It appears that we are going from storm to storm; that in fact, life becomes a waiting game for the next storm to come. We batten down our lives and things slow down. We don’t want to be caught unawares. But life is not about waiting for the next storm to pass. Rather, it is about learning to dance in the rai! (and as many of you know I am a dancer). I have found that one needs faith to dance in the rain when one can barely walk. As I was reflecting and dancing after a recent storm I looked around and realized that we at Hope at the Beach have been dancing in the rain and sunshine for nearly nine years. What brought this clearly to my mind was on a recent Sunday – as I was giving Communion to the gathered folks at the beach, a young man, his name is Zack, came over holding his surf board and dressed in his wet suit and asked for communion. When Zack began to come to Hope, he was nine years old and a student at M&M Surf School. He was so excited about Church on the beach that the next Sunday he brought his parents. They all have been attending since that time. He has graduated from high schoo,l has been attending Long Beach State, and is soon going into the Coast Guard. We are so grateful to God for sending Zack and his parents to our fellowship and for the faith that has been maturing in their lives. He is not the only one who has grown up in this fellowship. Austin is another young man who has been coming to our services since our first Easter service. His mother is Jill who plays the jamba at our services and his step father is none other than Big Mike of M&M. Austin, too, has graduated and is entering the Air Force on November 22. These young men and women (that’s Amber with Austin) and so many others have been dancing with me during the stormy times and the bright blessed sunny times. God has and will continue to sustain us and fill us with great joy and peace no matter what comes our way. 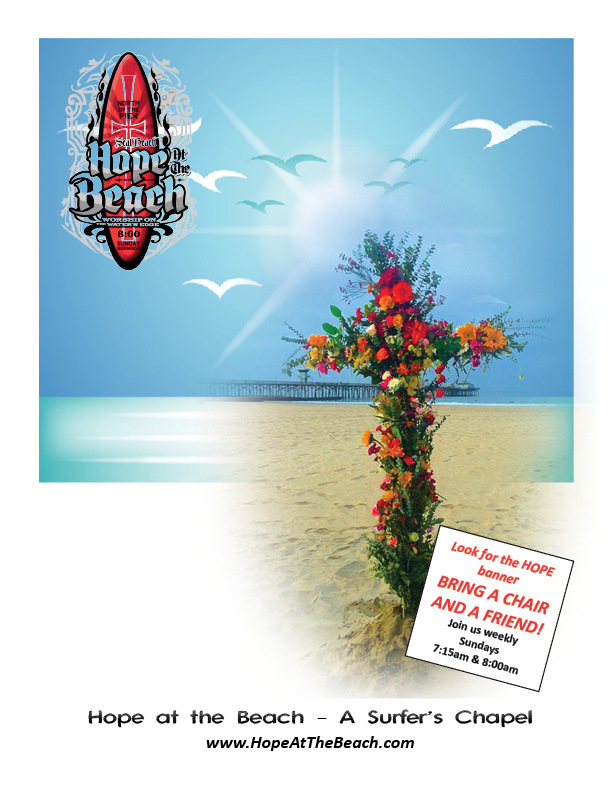 Please continue to pray for Hope at the Beach, all those who attend, and all who may wander by…May they hear a word of hope in these stormy times.